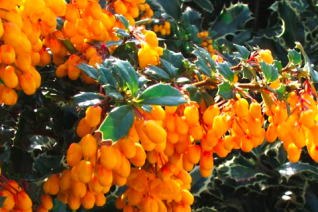 Very cool, rare evergreen barberry hybrid that is naturally occurring in the far southern Andes of Chile/Argentina. 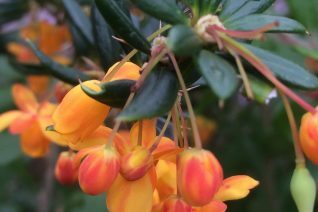 Apparently where B. darwinii and B. linearis grow together you can get this lovely huge evergreen flowering shrub. In early spring the arching stems are lined with pendant flowers that arrive as bright red buds and open to hot orange- both colors are present on the flowers which have the fragrance up close of coconut oil. Large growing arching shrub with kind of a wonky habit. Site it where you can spot the vivid flowers in March and then let this spiny creature fade into the background for the rest of the year. Completely drought adapted but will also take regular water. Virtually any soil apart from standing water. Perfectly hardy to cold. High deer resistance. Very difficult to propagate so we only have this fast growing handsome shrub on occasion. But no one else grows it so we list it. Long lived.